In 1968 a team of scientists and engineers from RCA announced the creation of a new form of electronic display that relied upon an obscure set of materials known as liquid crystals. At a time when televisions utilized bulky cathode ray tubes to produce an image, these researchers demonstrated how liquid crystals could electronically control the passage of light. One day, they predicted, liquid crystal displays would find a home in clocks, calculators—and maybe even a television that could hang on the wall. Half a century later, RCA’s dreams have become a reality, and liquid crystals are the basis of a multibillion-dollar global industry. Yet the company responsible for producing the first LCDs was unable to capitalize upon its invention. In The TVs of Tomorrow, Benjamin Gross explains this contradiction by examining the history of flat-panel display research at RCA from the perspective of the chemists, physicists, electrical engineers, and technicians at the company’s central laboratory in Princeton, New Jersey. Drawing upon laboratory notebooks, internal reports, and interviews with key participants, Gross reconstructs the development of the LCD and situates it alongside other efforts to create a thin, lightweight replacement for the television picture tube. He shows how RCA researchers mobilized their technical expertise to secure support for their projects. He also highlights the challenges associated with the commercialization of liquid crystals at RCA and Optel—the RCA spin-off that ultimately manufactured the first LCD wristwatch. The TVs of Tomorrow is a detailed portrait of American innovation during the Cold War, which confirms that success in the electronics industry hinges upon input from both the laboratory and the boardroom. 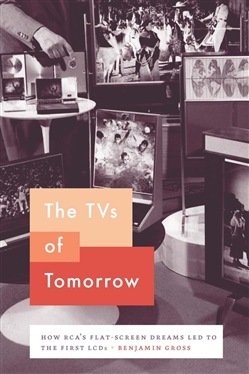 Acquista The TVs of Tomorrow in Epub: dopo aver letto l’ebook The TVs of Tomorrow di Benjamin GROSS ti invitiamo a lasciarci una Recensione qui sotto: sarà utile agli utenti che non abbiano ancora letto questo libro e che vogliano avere delle opinioni altrui. L’opinione su di un libro è molto soggettiva e per questo leggere eventuali recensioni negative non ci dovrà frenare dall’acquisto, anzi dovrà spingerci ad acquistare il libro in fretta per poter dire la nostra ed eventualmente smentire quanto commentato da altri, contribuendo ad arricchire più possibile i commenti e dare sempre più spunti di confronto al pubblico online.